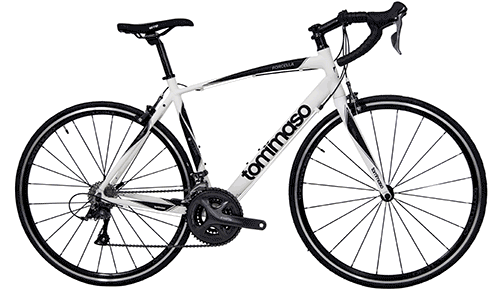 Tommaso Forcella is intended for the real connoisseurs of the distinct Italian design who wish to upgrade to an affordable, yet high-quality and lightweight road bike. Tommaso Forcella is by far one of the best deals that you can get in the road cycling world. It began its life as a variation of Tommaso Imola, but then its creators decided that it deserved a name of its own. That’s how Tommaso Forcella was born, and it was even improved in the process. Today, Forcella stands for elegant Italian design, fantastic value for the money, a smart mix of aluminum and carbon materials, and simply fabulous road cycling. Tommaso Forcella, like most other Tommaso bikes, is hard to ignore when you spot it with your peripheral sight in your room or in your garage. Its smooth lines and the aggressive matte black or the modern matte white colors will urge you to take it out and ride it farther than the last time. Let’s see what you can expect to get in terms of components and performance when you do that. There is a lot to like about this road bike, to be honest. To start from the most obvious things, the frame is built from Tommaso’s premium 6061 aluminum and the fork is made from carbon fiber. Carbon forks are not often seen on bikes in this price range, so this is already something that makes Forcella stand out. Because of that, this bike weighs around 23 lbs, which is pretty good for an entry-level model. The geometry is suitable both for beginner and intermediate riders, as it provides an excellent mix of ergonomy and comfort, but a hint of aggression as well. If you get closer and look at the details, you will see that Tommaso Forcella has Shimano Claris written all over it. Not many budget road bikes can boast of a uniform full Shimano setup, but Forcella certainly can. Having all components taken from the same groupset ensures harmony between different parts, as they are built to work well with each other. Therefore, you have high performance even on a more affordable groupset. 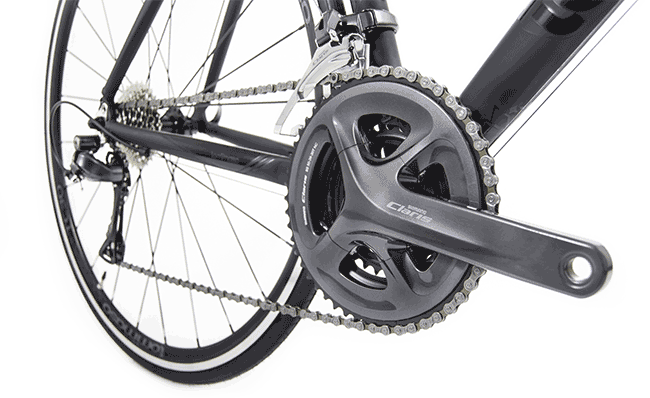 The Shimano Claris drivetrain comes with 24 gears. The crankset is a 30/39/50T, whereas the cassette is an 11-28T setup. So, even though this is not a more modern 2×10 drivetrain, you get plenty of gears for every situation you find yourself in. Tommaso Forcella does not have disc brakes. 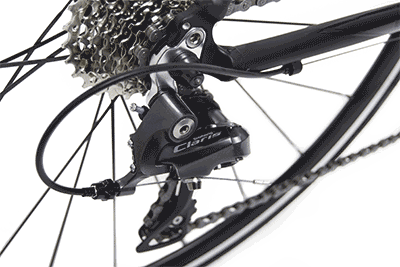 Instead, it has Shimano Claris V-brakes, which some riders will find as an advantage and others as a disadvantage. It all depends on your preferences. One thing is certain, you won’t have any problems stopping on a dime most of the time. Finally, it’s important to mention the aerodynamic Tommaso TC-30 wheelset with a 30 mm rim, built in-house by Tommaso’s engineers. It comes with a pair of stock Kenda tires that are 25 mm wide, which we have found to roll really well on the road. Of course, you can swap them for a thinner or wider pair later on, if you wish to do so. We stand behind our claim that Tommaso Forcella is a fantastic road bike that not many other models in the same range can compare to. However, it has some slight issues that you should be aware of before buying like all other bicycles do. First of all, you should be extra careful about the sizing, since Tommaso has a measuring system that differs slightly from other manufacturers. Namely, they offer their bikes in six sizes, from XXS to XL, which is more than other popular brands. Even though this lowers the chance to be “in-between two sizes,” you should pay close attention to their sizing chart. 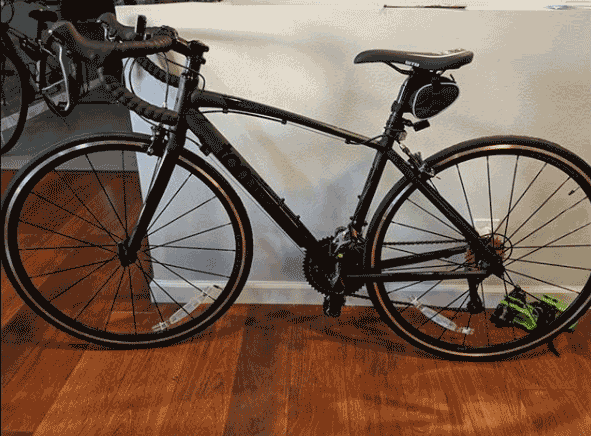 According to the user reviews available online, some riders have had issues with the saddle, the wheels, and the gears. However, it’s nothing out of the ordinary. The saddle is a personal preference. Some riders will love it, others will hate it and burn it at the stake. When it comes to the wheels and the gears, this is a common issue on all cheaper bikes, as they need more frequent fiddling and adjustments. But, overall, the majority of people who tried the bike, have only words of praise for it. If you’re looking for a bike that has that magic and the ever-elusive golden ratio between quality and price, Tommaso Forcella is the one. You’ll likely agree with us every time you take it out for a ride.